In the 12 years since the rapper known as Notorious B.I.G. and Biggie Smalls was murdered, fans and entertainers from Drake to Lamar Odom have sported the multicolored Coogi sweaters he wore and rapped about. The NBA’s Brooklyn Nets pays homage with its ‘Brooklyn Camo,’ a Biggie-inspired pattern on team garb and jerseys—a move that has landed the team in litigation. In taking on the NBA, Nike Inc. and others, Coogi is making a case beyond copyright infringement. It’s claiming its designs are so identified with B.I.G. and celebrity culture that they deserve a broad legal protection for product appearance and packaging that’s typically reserved for things like Coca-Cola bottles and McDonald’s uniforms. Coogi’s assertion that its copyrighted designs are a brand signature for its entire catalog could shake up the multi-million-dollar world of fashion, where social media, endorsements and high-volume retailers are challenging how rights are established and protected. A Coogi win in court could make it harder to make fast fashion knockoffs, and higher-end designers might be more conservative in patterns and colors to avoid litigation. “Coogi claims a signature in threads. And that’s what’s unusual about this case. Because they’ve developed a portfolio of patterns that are different but similar to one another enough in the consumer mind to create an emanation of identity,” said Susan Scafidi, founder and academic director of Fordham University School of Law’s Fashion Law institute in New York. The Nets declined to comment. NBA spokesman Mike Bass said “there is no merit whatsoever to these claims.” Nike did not immediately respond to a request for comment. The U.S. Patent and Trademark Office can grant a trade dress registration. But courts are also able to enforce trade dress rights, and that is the approach Coogi is taking. Achieving trade dress has traditionally called for a company to go beyond using its patterns for clothing, Christiane Schuman Campbell, a Philadelphia partner at Duane Morris LLP specializing in company brand management, said. Companies need to use marketing and advertising so consumers believe that the pattern comes from only one place, she said. Campbell noted she’s seen an increase in fashion companies protecting their creations with trade dress, due to an increasing awareness of intellectual property rights. And “fast fashion” retailers, like H&M and Forever 21, “that can get what’s on the runway into stores very quickly because of mass production” have also raised the potential for infringement, she said. Campbell also noted social media is shining light on potential infringers while providing a platform for designers to get their products in front of potential consumers. “Companies are able to advertise and promote themselves and sell things online because they’re doing that without a real platform, without brick and mortar, without a lot of overhead, they set up an Instagram account and they’re instantly selling swimsuits,” Campbell said. Coogi relies partly on social media in making the case for both trade dress and its connection to Biggie. 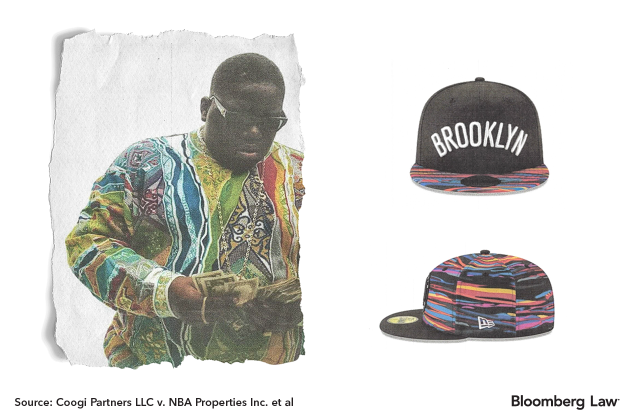 Likewise, Coogi provides screenshots of online retailers selling products that allegedly “plagiarize the Coogi Trade Dress” while “connecting the design to Biggie by using another of his nicknames ‘Notorious,’” according to the lawsuit. Coogi directly connects this behavior to that by Nike and others in creating, selling and marketing Brooklyn Camo, said Alan Behr, New York partner in the Corporate & Business Law Department and Intellectual Property Practice at Phillips Nizer LLP. “Because it’s Biggie, therefore it’s Coogi. That’s the step they’re requiring people to make, and that’s a tough thing to prove,” he said. Some clothing companies have secured trade dress in court battles. K-Swiss Inc. got protection for its shoe designs in 2003. In 2012, the U.S. Court of Appeals for the Second Circuit court determined that the red line on the heel of a Christian Louboutin shoe of a different color was protectable by trade dress. “You hope that you have enough notoriety that someone seeing the garment knows it instantly as coming from a single source like the red sole in the Christian Louboutin shoe,” Jonathan Hyman, a partner in the Los Angeles office of Knobbe Martens, said. A win for Coogi would help designers navigate the larger debate about how to adequately protect fashion designs, said Art Neill, founder and executive director of New Media Rights, a California Western School of Law nonprofit legal services program. Copyright and trademark rights, including trade dress, don’t cover functional or utilitarian aspects of clothing, and that creates “a constant tension” for designers looking to protect elements of their products, Neill said. And “design elements” that can “be perceived separately” are what tend to end up protectable. “They’re just saying that the Pea Soup design and the Ricotta Design are examples of the Coogi trade dress. So really what they’re arguing is that all of their sweaters are protected by trade dress,” he said. If the court rules that Coogi’s whole catalog deserves trade dress protection, it “could make certain manufacturers within the fashion industry a little more cautious about some of their fabrics for fear of liability,” Scafidi said. A win for Coogi also could cause fashion companies to produce more monochrome or solid patterns, while high-volume brands like H&M and Zara “might be a little less likely to create Coogi lookalikes knowing that Coogi is out there paying attention,” Scafidi said. “This won’t be the last time that there’s an intersection among the worlds of fashion and celebrity that are becoming slowly more entwined—and sports. Those three things tend to get linked more and more,” Behr said.